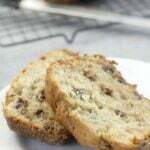 Chocolate Chip Banana Bread is made with cream cheese to keep it tender and moist. With lots of chocolate chips, this one is a special treat! 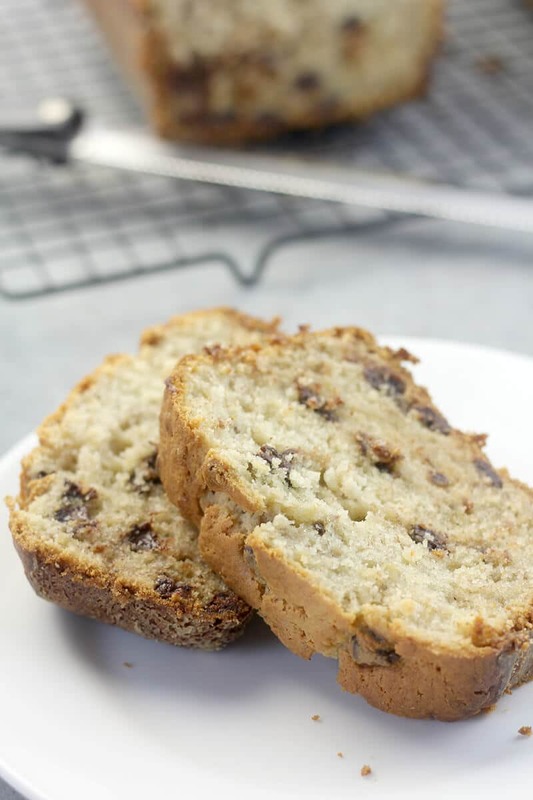 This Chocolate Chip Banana Bread freezes well so it’s a great make ahead dish for vacation or to keep in the fridge for when you need to deliver a sweet home-baked basket of goodies. My regular Banana Bread recipe to me is the perfect breakfast food. It’s portable, freezes well, and is nourishing and comforting when people need nourishing and comforting. And don’t we all need nourishing and comforting right now? But this Chocolate Chip Banana Bread—well, this feels decadent and more than just comforting. This feels like your Grandma just walked in the front door and gave you a big old hug. That’s how I always wanted the boys to feel when they came home from school. 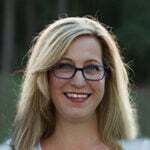 There would usually be brownies or cookies or something else that felt special, something that encouraged sitting down for a moment with a snack and glass of milk and talking about their day. Lots of days they didn’t want to talk at all, but usually they did. The key is to try and listen without advising (I’m still a work in progress on that one) and to refrain from passing judgment. Tough, I know. But that’s what lets them know it’s safe to open up to you. 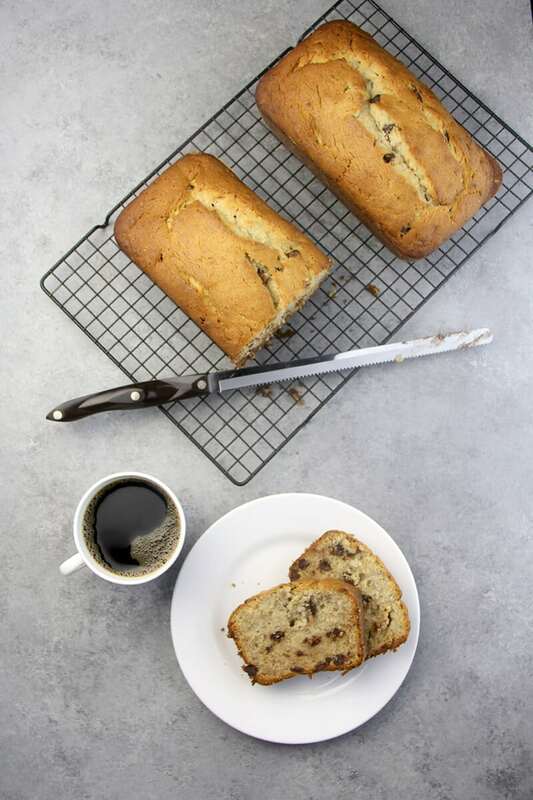 So let’s talk about this Chocolate Chip Banana Bread! This recipe is quite different from my regular Banana Bread. This one has cream cheese, which I love in baked goods because it adds a little tang and a lot of moistness. I cannot stand dry cakes or breads. You can use bittersweet chocolate chips since this recipe does have a good bit of sugar, or you can use semi-sweet chocolate chips. They are both delicious additions to this tender, crumbly, sweet bread. Chocolate Chip Banana Bread is one of my favorite things to gift someone with, either someone who’s just had a baby or maybe when dropping off a sympathy meal. I love that you can make this bread a day or so before you need it, or even a week and store it in the freezer. And you can even make smaller loaves in those mini loaf pans—wrap in some pretty cellophane and you have lovely Christmas gifts! 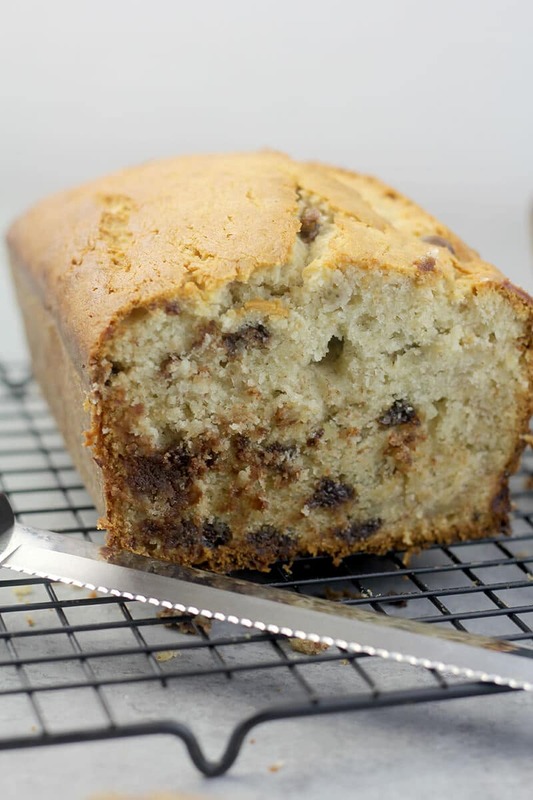 Chocolate Chip Banana Bread is made with cream cheese to keep it super tender and moist. With lots of chocolate chips, this one is a special treat! Preheat oven to 350. Grease and flour two loaf pans. Beat butter and cream cheese on medium speed until light and creamy. Gradually add sugars, and beat until well blended and creamy. Add eggs one at a time and beat until just blended. Combine flour, baking powder, baking soda, and salt, and slowly add to butter mixture, beating on low speed until just blended. Stir in bananas and vanilla. Stir in chocolate chips. Pour batter into loaf pans and bake for one hour, or until pick inserted in the center comes out clean. You may need to cover with foil the last 15-20 minutes to prevent over-browning. Cool pans on a rack for 10 minutes, then remove bread from pans. Cool at least 30 minutes before slicing. 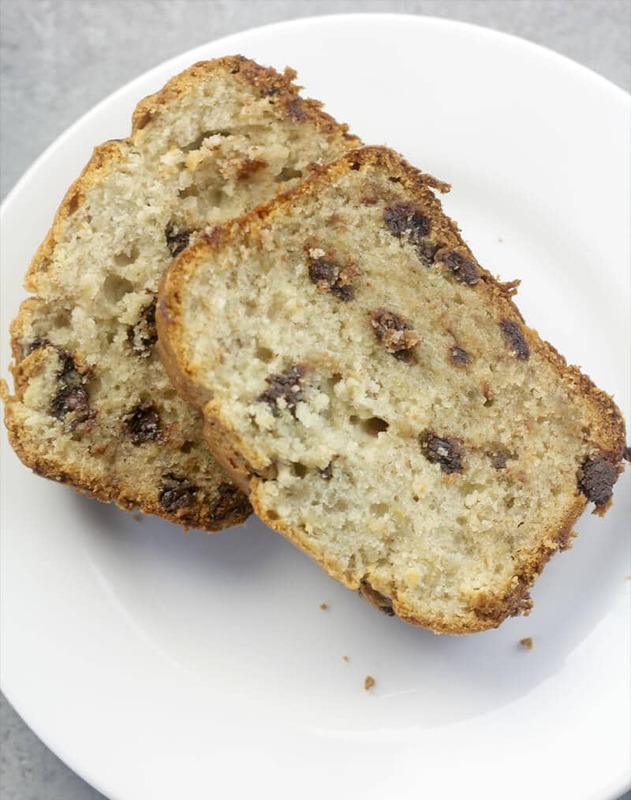 Recipe adapted from Southern Living's Banana Nut Bread.